The savvy viewer will immediately turn off the movie at this point, content to have enjoyed the entire episode as a comedic video short, made to promote some strange foreign company instead being part of an actual movie. 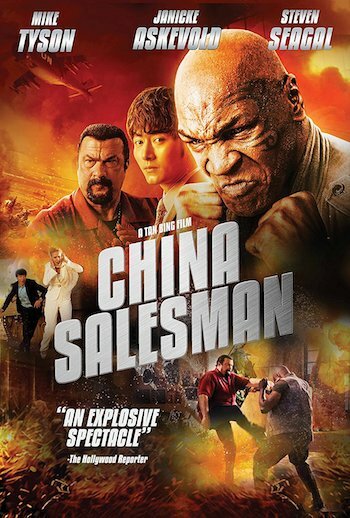 In retrospect, it doesn’t come as any surprise that Tyson is relegated to supporting status while Seagal disappears from all but a few more minutes of screen time since this was a Chinese movie called China Salesman. Sadly the film is true to its title (and not its awesome Seagal/Tyson poster) and spends the bulk of its time (almost two hours, but somehow feels at least five times longer!) on Yan Jian, a rep for DH Telecom, a Chinese company battling evil European telecoms for the contract in this African nation. What this means is that for the first part of the movie we have a front row seat for the bidding process which involves lots talk about CDMA and 3G. When Yan announces he’s developed a program that cuts connection times by 1.5 seconds, I was half expecting Yan to turn to the camera and offer me a free Huawei phone if I switched to DH. When Tyson and his militants disrupt cell service in the country, Yan volunteers to go fix the three towers affected. Taking Yan out of the boardroom and dropping him into a desert conflict has the makings of energizing things but our wispy and overly earnest hero finds himself in a series of adventures that go on too long (he gets captured by natives after a misunderstanding involving him kidnapping a native girl in a sequence that adds nothing to things) and are just poorly done such as the ham-handed propaganda the film engages in when he defuses a violent confrontation by flying the Chinese flag which grants him and his team safe passage. After the United Nations provides an assist by using their attack helicopter against Tyson and becoming an airborne cell tower for Yan (was this movie funded by the Chinese government or Inforwars? ), the country is saved and it appears the movie must finally be over. Until the evil European telecom MTM shows up with their attorney to announce they are suing DH because Yan allegedly stole their secrets! By the time Seagal materializes (or at least his stunt double does) for a few seconds to rescue Yan on a motorcycle and whisk him to safety, you’ve long since given up trying to understand things like why releasing the source code publicly is critical or how we ended up at a reception in Tunisia honoring Yan or why Tyson has chosen that venue to publicly turn on his European partner after knowing of his treachery several scenes before (during the cruise ship attack on Yan which seemed like just another unwanted random encounter you might expect out of a poorly balanced JRPG). At first blush, tricking the Chinese into signing Seagal for one of their action movies might seem like a clever (and frankly mean) tactic in a trade war, but he’s the least annoying and most reassuring thing about the movie. Tyson is memorably terrible and his character is borderline offensive, while all else involved provide stilted performances that are just routinely low budget bad. The story is dull and hard to follow which dovetails perfectly with the crappy action scenes and laughable head scratching moments like the montage of Yan falling down a sand dune intercut with his scenes of his female partner taking a bubble bath. Supposedly this was all based on a true story and one can only assume that the names were changed to protect the embarrassed. Proving though that there may yet be hope for the human race, despite being made for Chinese audiences, it apparently even bombed with them.